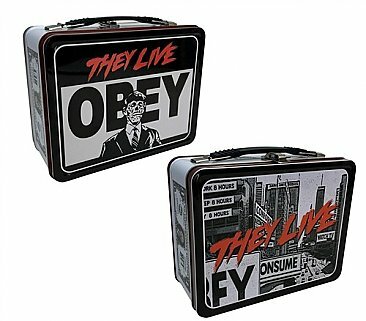 They Live Lunch Box! Factory Entertainment's high quality tin totes features fantastic artwork from everyone's favorite pop-culture brands! This is a solid addition to my geek collection- as a big fan of "THEY LIVE" there is very little merchandise to collect. This is a well made lunch box with some of the classic iconography from the film. Reasonable price, and well made.